WELCOME to my dreams and visions, realities and worlds, passion and angst. Hopefully, I can show you the way beyond the words and paragraphs on my pages so you can climb through the portal and experience for yourself the breeze on your face, the grass under your feet, and the crush of his lips against yours. 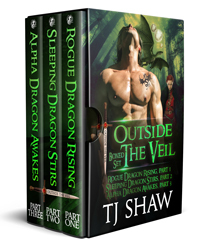 I’m pleased to announce the Outside the Veil Boxed Set, containing Rogue Dragon Rising, Sleeping Dragon Stirs, and Alpha Dragon Awakes is available for sale at all major e‐retailers! Also pleased to announce that Rogue Dragon Rising will continue to remain FREE on these vendor sites! If you wish to become a reviewer for TJ and receive advance reader copies (ARCs) before they are available to the general public, sign up HERE to be included on the reviewer list! Alpha Dragon Awakes is now available for purchase! Accepting a dragon’s love to forge a new future.